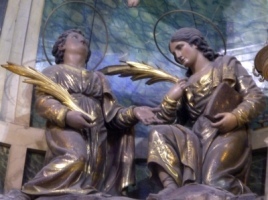 Commemorates the revelation by Jesus of His divinity to Saint Peter the Apostle, Saint James the Great and Saint John the Apostle on Mount Tabor outside Jerusalem. 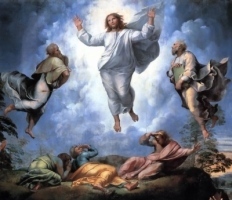 The Old Testament patriarchs Moses and Elijah also appeared as a brilliant white light radiated from Christ. Anna Maria lost her father at age four. In her teens she received a marriage offer from a local notary, but turned it down and made a vow of virginity. Her mother died when Maria as 19, and the girl moved to Turin, Italy where he became the friend of Marianna Scoffone, an Italian noblewoman who supported her as she visited parishes in the city, taught catechism to children, visited the sick in hospital, helped the poor and neglected. Marianna Scoffone died in 1882. One morning after Mass at the Capuchin church in Loano, Italy, a stone fell from a nearby convent under construction, striking a young worker on the head. Anna Maria cleaned the wound and gave the man some money to live on while he recovered. The building was to house a community of women religious, and the sisters were looking for a spiritual guide. When they had heard of the incident in the church, they took it as a sign that Anna Maria was the person they were looking for. A Capuchin priest, Father Angelico Martini convinced her to enter the community, and after a year she joined them in the house. She took the name Sister Maria Francesca of Jesus, and on orders of Bishop Filippo Allegro, she became the superior and formation director of the group. Thus began the Institute of the Capuchin Sisters of Mother Rubatto. In 1892 Sister Maria and some sisters went as missionaries to Montevideo, Uruguay and then spread their apostolate further into Uruguay and then Argentina. Mother Maria crossed to the Americas seven times, and was asked to begin a mission in the rain forest with Capuchin friars from Milan, Italy; she and six sisters stayed at the mission for three months. Eighteen months later, on 13 March 1901 the sisters, the Capuchin missionaries, and many of the faithful were martyred there. One of eight children born to Jan and Antonina Dulny, and raised in a very pious family. Seminarian in the diocese of Wloclawek, Poland where he was known for being devout, studious (though not a great student), and showing a true vocation to the priesthood. Arrested on 7 October 1939 with other seminarians and their teachers as part of the Nazi invasion of Poland that triggered World War II in Europe. They were all imprisoned in the Salesian College of Lad, which the Nazis had turned into a temporary detention center, and the teachers resumed covert instruction of the seminarians. Tadeusz was transferred to the Sachhausen concentration camp near Berlin, Germany on 26 August 1940, and then to the Dachau camp in Germany on 15 December 1940. There he was beaten, tortured, starved, over worked and basically abused to death over a period of 20 months; he was known to give his food rations to other prisoners whom he thought were in worse shape than he was. Martyr. Lifelong layman in the archdiocese of Valencia, Spain. Sacristan of the collegiate church of Gandia, Spain. Married to Rosa Tarazona Ribanocha in October 1923. Member of several lay apostolate groups, including Catholic Action, and known as a man of faith and prayer with a devotion to the Sacred Heart. He gave shelter monks and nuns who were forced to go into hiding during the persecutions of the Spanish Civil War. The anti–Catholic militants eventually found him, as well. Martyr. Teenage brothers who made a public proclamation of their Christianity, and were promptly arrested on the orders of Dacian, governor of Spain. Scourged to make the boys retract their confession; they refused. Martyrs. 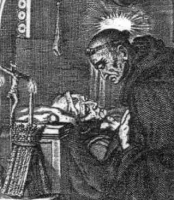 12th-century hermit and Cistercian lay brother at Altenberg Abbey where he worked as a shepherd. Miracle worker, including ending a drought by stabbing his shepherd's crook into the ground which caused a spring of water to erupt; the spring continues to flow today, and the water is known for healing powers. Twelfth century forest hermit in Luxemburg who trusted so strongly to provide that he didn’t even bother with shelter. 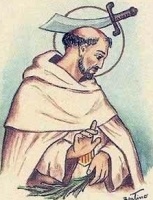 Legend says that Gislain’s reputation for holiness was that Saint Bernard sent Saint Acardo to visit the hermit and ask for his prayers for their new monastery in Hemmerode; Acardo, and a group of angels, later attended the death of Gislain. Soldier in the army of Blessed Charlemagne. 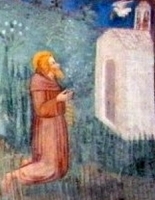 Following the battle of Mortirolo, Glisente retired from military life to live as a hermit on Mount Berzo near Brescia, Italy, and evangelize the valley region around it. Known for his zeal for the faith and his love of animals. Commander of the Mercedarians in Valencia, Spain. Imprisoned by invading Muslim Moors, then sent to live as a slave in Granada, Spain; slavery was the regular lot of captured Christians. When Guillermo continued to preach about Jesus, he was beaten; when that didn’t stop him, he was murdered. Martyr. Married, and father of the future Pope Saint Silverius. Widower. Pope. Best known for the written work Formula of Hormisdas, a succinct confession of the faith, acceptance of which ended the Monophysite schism of Acacius in the Eastern church. 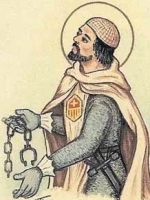 Born to the 13th century nobility, he gave up the worldly life to become a Mercedarian knight, and to devote himself and his worldly goods to the ransom of Christians enslaved by Muslims; in 1263 alone he rescued 208 of them. Spiritual student of Blessed William de Bas. Brother of Pope Saint Callistus II. Educated by Benedictines. Benedictine monk at Saint Peter's abbey at Pavia, Italy. Bishop of Savona, Italy in 1129. Two hundred Benedictine monks at the Saint Peter of Cardegna monastery, Burgos, Spain who were martyred in the 8th century by invading Saracens. Benedictine monk at the Abbey of Cluny. Abbot of Maillezais Abbey. Bishop of Saintes, France. Monk. Abbot of the Castilian monastery of Cardeña in the archdiocese of Burgos, Spain where he led over 200 brother monks. Martyred by Saracens. Monk at Amida (Diarbekir), Mesopotamia. Known as a miracle worker, and for his great austerities. Hermit in Breedon, Leicestershire, England.